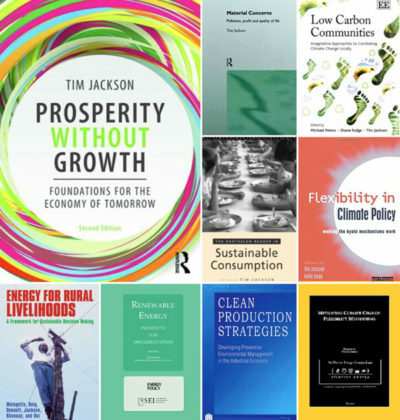 In addition to his ground-breaking books Material Concerns (1996) and Prosperity Without Growth (2009/2017), Tim has published his research to date in over 400 articles. A list of selected publications can be found below. The full list of publications can be downloaded in pdf (last updated 4 Nov 2018). Jackson, T and P Victor 2019. Managing Without Growth: Exploring Possibilities. In: Victor, P: Managing Without Growth—Slower by Design, Not Disaster. Edward Elgar. Mair, S, Druckman, A and T Jackson 2019. Higher Wages for Sustainable Development? Employment and Carbon Effects of Paying a Living Wage in Global Apparel Supply Chains. Ecological Economics, Vol 159, 11-13. Jackson T 2018. How the light gets in—The science behind growth scepticism. Centre for the Understanding of Sustainable Prosperity, Blog, 4 November 2018. Molho, N and Jackson, T 2018. Which financial architecture can protect environmental commons? Responsabilite and Environment, 92: 69-73. Jackson, T 2018: The Post-Growth Challenge: Secular Stagnation, Inequality and the Limits to Growth. Ecological Economics, Vol 156. Jackson, T 2018: Beyond Redistribution—Confronting inequality in an era of low growth. An Economy That Works Briefing Paper Series, No 2. London: All-Party Parliamentary Group on Limits to Growth, July 2018. Isham, A, Gatersleben, B and T Jackson 2018. Flow Activities as a Route to Living Well With Less. In: Environment and Behavior. Jackson, T 2018: L’économie, c’est l’engagement du présent pour l’avenir. In: LaRevueDurable. Numéro 61, été-automne 2018, semestriel, pp 12-18. Jackson, T 2018: Secular Stagnation’ meets ‘GDP Fetish. Centre for the Understanding of Sustainable Prosperity, Blog, 13 May 2018. Jackson, T 2018: Understanding the ‘New Normal’—The Challenge of Secular Stagnation. An Economy That Works Briefing Paper Series, No 1. London: All-Party Parliamentary Group on Limits to Growth, July 2018. Jackson, T and Smith, C 2018. Towards Sustainable Lifestyles. Understanding the Policy Challenge. Chapter 16 in Lewis, A (Ed). The Cambridge Handbook of Psychology and Economic Behaviour. Cambridge University Press, Cambridge. Pp. 481-515. Mair, S, Druckman, A and T Jackson 2018: The Future Of Work — Lessons from the History of Utopian Thought. CUSP Working Paper No 13. Guildford: University of Surrey. Molho, N and T Jackson 2018. Which financial architecture can protect environmental commons? Responsabilité & Environnement, N° 92. October 2018. Rye, C and Jackson T. A review of EROEI-dynamics energy-transition models. In: Energy Policy, Vol 22, 2018. Jackson, T 2017. An Economy That Works. In: Resurgence & Ecologist, No 302 May/June 2017. Jackson, T 2017. Ins Morgen investieren. In: Geht doch! Geschichten, die zum Wandel anstiften. München: Oekom. Jackson, T 2016. Growing Pains. In: RSA, 21st Century Enlightenment, Vol 3 pp. 25-29. Jackson T and P Victor 2015. Does slow growth lead to rising inequality? – A stock-flow consistent exploration of the ‘Piketty hypothesis’. PASSAGE Working Paper 15/03. Guildford: University of Surrey. Jackson, T, Victor, P and A Asjad Naqvi. Towards a Stock-Flow Consistent Ecological Macroeconomics. PASSAGE Working Paper 15/02. Guildford: University of Surrey. Jackson, T and P Victor 2015. ​ Credit creation and the ‘growth imperative’ – a quasi- stationary economy with debt-based money. PASSAGE Working Paper 15/01. Guildford: University of Surrey. Jackson T 2015. If the rich world aimed for minimal growth, would it be a disaster or a blessing? The Economist, 01 August 2015. Jackson T 2015. Growth is not the answer to inequality. The Guardian Blog, 13 March 2015. Jackson T 2015. New Economy. In: Degrowth. A Vocabulary for a New Era. D’Alisa, F, Demaria, F and Kallis G (Eds). Routledge, Oxon. pp. 178-181. Jackson T 2014. The dilemma of growth: prosperity v economic expansion. The Guardian ‘Rethinking Prosperity’ Blog, 22 September 2014. Jackson T and P Victor 2014. Does slow growth increase inequality? – A stock-flow consistent exploration of the ‘Piketty hypothesis’. PASSAGE Working Paper 14/02. Jackson T and P Victor 2013. Green economy at a community scale. Metcalf Foundation: Toronto | November 2013. Jackson, T 2013. The Altruist Within. In: Sofia #109, pp. 4 – 9. Dinah Livingstone (Ed). ISSN: 1749-9062 | September 2013. Jackson, T 2013. Opinion – Moving to a Green Economy. In: Nick Stevens (Ed). Britain in 2014. Economic and Social Research Council (ESRC). Immediate Media Co. pp. 24-25. Jackson, T and P Victor 2013. Developing an Ecological Macroeconomics. Centre for International Governance Innovation | cigionline.org, 11 September 2013. Costanza R, Alperovitz G, Daly H, Farley J, Franco C, Jackson T, Kubiszewski I, Schor J, Victor P. 2013: Building a Sustainable and Desirable Economy –in-Society- in-Nature. ANUE Press, Caberra, Australia. Druckman A, Buck I, Hayward B and Jackson T. 2013: Time, gender and carbon: how British adults use their leisure time. In: Coote, A & J Franklin (Ed.). Time on our side: why we all need a shorter working week. New Economics Foundation: London (pp.101 – 112). Jackson, T and P Victor 2011. Productivity and Work in the New Economy – Some Theoretical Reflections and Empirical Tests, Environmental Innovation and Societal Transitions, Vol.1, No.1, 101-108. Jackson, T 2011. Confronting consumption: challenges for economics and for policy. In S Dietz, J Michie and C Oughton (Eds) The Political Economy of the Environment: an Interdisciplinary approach 189-212. Abingdon and New York: Routledge. Jackson, T 2011. Societal transformations for a sustainable economy. Natural Resources Forum 35: 155-164. Jackson, T 1996. Material Concerns – pollution profit and quality of life, Routledge, London. The full list of publications can be downloaded in pdf (last updated 4 Nov 2018).